In the haze of her purple night? In the dark of her purple room? Like her lilac in bloom? In the bed of her purple rose? The sweet pain as it grows? At the dawn of her purple day? That keeps asking "Please stay?" I wrote this small poem shortly after finishing the artwork. I was looking at it and the verses began to float in my head, just like that. It's strange, because I don't write poems on regular basis -- I have written a few in my youth, but who hasn't? And they were all in Georgian, so this would be my first poem in English. Anyway, back to the artwork. It's sort of a commission, only I don't get paid for it -- just an old promise redeemed. 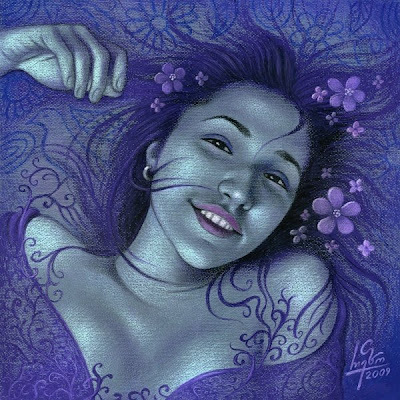 My friend, who is the model in this picture and the "client" at the same time, has a thing for lilacs and all related tints and hues, so the color choices were obvious. Since I rarely work with purple and violet, it was a good opportunity to visit that unexplored part of the spectrum and play around. Also, it was my second time with oil pastels -- another virgin soil for me. Thus my enjoyment from the process was doubled. I chose a bluish-violet pastel paper, very toothed and very hard. Not the best choice for oil pastels, but I like the canvas feel it provides. The size of the paper was another rarity for me -- most of my works don't exceed standard A4 size, and this one makes a whopping (for me, that is) 40 cm square. But, despite the size, the drawing didn't took much time -- the paper was quite dark, so I didn't have to cover all the surface. I managed in two days. The portrait came out a bit darker than most of my other works, and a lot rougher around the edges than my usual style, but I don't complain -- change of pace is always refreshing.